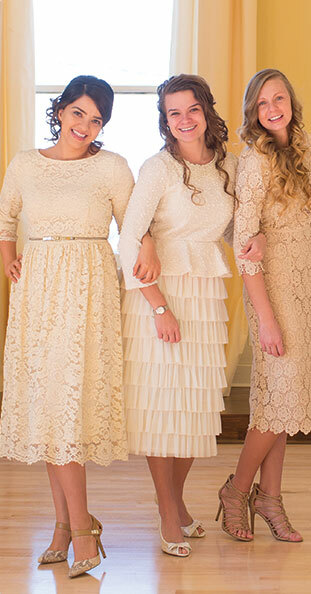 If you have been on the search for a modest and timeless “little ruffle dress” – look no further! This long and luscious dress of jersey and lace is sure to make you feel like you are dreaming in a vintage era. The body-slimming construction makes it a lovely fit for ladies of all sizes. Because of the special knit used, the dress's layers lay close to the body, causing a slimming, stylish look. This beautiful fabric has lots of stretch. I bought this dress for both my daughter and myself and they are beautiful. I can’t wait to wear them for my brother’s wedding at the end of the month. I was so excited to see my dress only after a whole day of ordering it! It came so quick!! It’s a beauty and fits me so well!! Thanks to Dainty Jewells for allowing an easy return and purchase of this dress! Beautiful dress and well made! We LOVE Dainty Jewel's dresses! This is the third one we have purchased for our daughter. They are top quality and beautifully made. They are modest and elegant! Their customer service is outstanding! We needed a dress in less than a week and they were able to get it to us just in time for a Father Daughter Tea! Absolutely beautiful dresses!